RACINE, WI--(Marketwire - January 22, 2008) - Pacific Sands, Inc. (OTCBB: PFSD), which manufactures environmentally friendly cleaning and water treatment solutions, announced today that the company has entered into an exclusive Midwest manufacturer's rep agreement with Weber / Moreton Sales & Associates (WMSA). Staffed by life-long pool and spa professionals with more than 60 years of combined industry experience, WMSA has successfully shepherded industry saturation for dozens of innovative pool and spa product lines. WMSA's hundreds of active sales channels include pool and spa product dealers, distributors, OEM Manufacturers and service professionals. 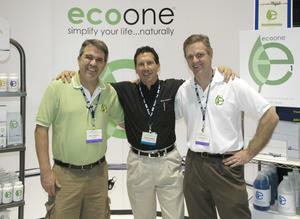 WMSA will represent the complete line of ecoone pool and spa water management products in 14 Midwest States. "It's very rare that we find a product with as much immediate success potential as the ecoone pool and spa water management systems," said Rich Weber. "This is a mature product line that is easy to use, environmentally friendly and beautifully packaged. We anticipate a significant, swift and profitable acceptance in the market." Pacific Sands National Sales Manager, Bob Vineyard, added, "The addition of a top level professional sales group like WMSA to our 'feet on the street' sales force represents an important milestone in our expanding sales and marketing strategy. Our 2008 goal is sales of $500,000 in the territory WMSA covers." Pacific Sands representatives will jointly premiere the new 2008 ecoone systems at the Mid-America Pool and Spa show in St. Charles, IL, January 23 - 24. Weber / Moreton Sales representatives can be reached at 825-224-9350 for ecoone product sales and distribution opportunities. Pacific Sands, Inc., promoting earth, health, pet and kid-friendly chemistry solutions, is publicly traded on the NASDAQ OTCBB. The company's core ecoone® pool, spa and household cleaning product lines deliver earth, health and kid-safer alternatives. More information is available at www.pacificsands.biz and our newly created e-commerce site: www.ecoONE.biz. The statements contained in this release and statements that the company may make orally in connection with this release that are not historical facts are forward-looking statements within the meaning of the Private Securities Litigation Reform Act of 1995. Actual results may differ materially from those projected in the forward-looking statements, since these forward-looking statements involve risks and uncertainties that could significantly and adversely impact the company's business. Therefore, actual outcomes and results may differ materially from those made in forward-looking statements. About this company Pacific Sands, Inc.